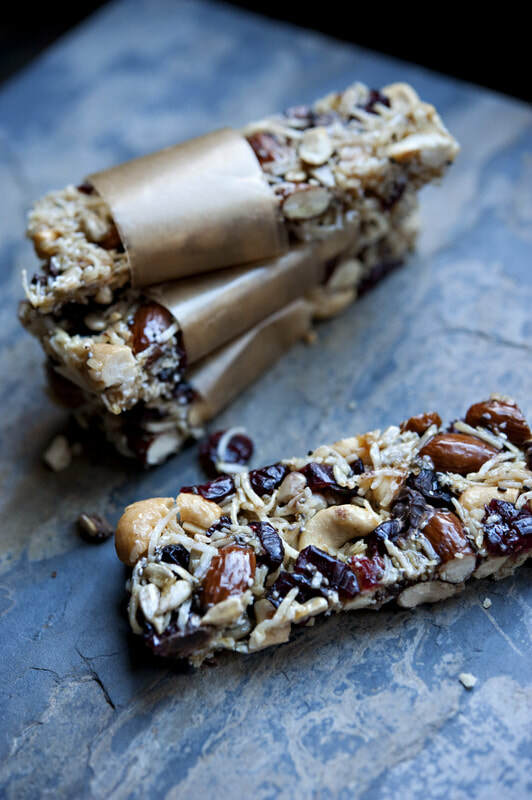 Other ingredients to add: dried fruit, any other nut, seeds (chia, sesame, flax, poppy), or even a bit of dark chocolate. Lightly toast nuts and coconut, in the oven, just until coconut is fragrant and lightly golden about 8-10 minutes. Heat honey, salt, water and vanilla in a small pot over medium heat until it starts bubbling. Have your candy thermometer in the pot. Stir occasionally. Lower to med-low heat and continue simmering uncovered until honey reaches 270F. This will take about 10-15 minutes on med low heat, and will happen rapidly once it reaches 250F. When honey has reached 270F, turn heat off and pour the nuts and coconuts into the pot, stirring well to coat. Also add the cranberries and anything else you may want to add, like the chocolate. Mixture may seem dry, but just keep mixing, until evenly coated. Spread out on a parchment lined 8x8 inch pan, or baking sheet, to about ¾ inch thick. Using a greased spatula, spread out evenly and press down firmly, compressing it down as much as you can. Cover with parchment and use your hands (if its not too hot) and press down. This will help the bars stay together when you go to cut them. Let cool uncovered on the kitchen counter for 45 minutes. Once it has cooled, flip onto a cutting board in one piece. With a long sharp knife, cut bars before they cool completely. Otherwise they will break when you try to cut them. After they're cut, let them cool down for an hour before storing. Store in an air tight container layered with parchment.